Rhett Butler is playing cards in a makeshift jail, where a converted horse stall serves as a cell, when he receives a surprise visit from the beautiful Scarlett O’Hara. "Thank heaven you’re not wearing rags,” Rhett tells her. "I’m tired of seeing women in rags." But when Rhett kisses her hand, he sees through her elegant disguise, "You can drop the moonlight and magnolias, Scarlett." Her hands are not those of a lady - she’s been working "like a field hand." 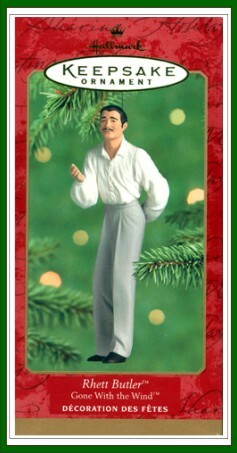 You can display this famous film scene with the Hallmark Keepsake Ornament featuring Scarlett, whose gown was sewn from the long green draperies from the glory days of Tara.